The NZCFS 2014 Conference, ‘Voices for Youth’, was a tremendous success, due in great part to the seamlessly efficient organisation by Sally Russell of Hawke’s Bay branch and her tireless branch members. The first sign that other branch members saw of the conference was a Chinese flag flying at the town centre as they drove in. On entering the Function Centre they were greeted by a stunning display of art, paintings and sculpture by Chinese artists Jim Lin, Dan Zeng, Deng Bangzhen and Lu Bo, which gave a beautiful backdrop to the more serious items for discussion. The meeting began on Friday afternoon, May 23rd, and was attended by 92 delegates. Opened by Dave Bromwich, President of the NZCFS, he first welcomed Life Member Cecil Fowler and commented on the good number of young people attending. He then outlined the concerns of many of the members as to how the Society is to proceed in the future and introduced an independent facilitator, Amanda Woodbridge of Ideas Shop, who ran the recent survey of all Society members’ views on the Society, to assist in working through the many suggestions and concerns voiced by branch members. It was really commendable that 174 members responded. Amanda’s report on the results of the survey, and a breakdown of responses, by branch, is available in the ‘Members’ area‘ of the website. There then followed a really lively and stimulating meeting with many ideas coming forth. For an in-depth report of the ‘brainstorming’ by all the attending delegates on how to improve the Society’s goals, please refer to the appropriate pdf in the ‘Members’ area‘ of the website. This is recommended reading for those who are keen to get ideas to enlarge and extend those goals. The results of the brainstorming session will be worked up by Dave Bromwich and a small committee into a strategic document. 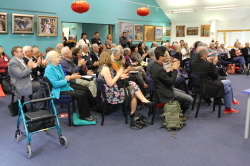 Hawke’s Bay branch President, Sally Russell gave a warm welcome to the distinguished guests, His Excellency, Wang Lutong, Ambassador of the PRC, Yuan Yuan, Cultural Attache in the Chinese Embassy, Simon Deng Li, NZCFS Honorary Patron and Mayor of Napier, Bill Dalton on Friday evening. The Society members were entertained by the Hastings Girls High School Kapa Haka group, who welcomed the visitors with a performance of a Waiata and sang and danced for the people attending. Napier Mayor Dalton then spoke of the importance of our contacts with China and being conscious of ‘correcting’ information on China. He was then invited to sit for a portrait by Deng Bangzhen. Dave Bromwich, president of the Society, introduced Ngahiwi Tomoana, Chair of Runanga, Ngati Kahungunu Iwi. Ngahiwi set the relaxed tone of the day, giving an amusing speech – first welcoming those present in Maori to Te Mata ‘the sleeping giant’ of Hawkes Bay. He also welcomed the ‘sleeping giant’ of China to New Zealand and commented on the very good relations that NZ has always had with China. He said that it was 5000 years since the Maori left China and they arrived in New Zealand about 1000AD. Jokingly he suggested they should claim their ancient homeland back! He concluded by saying his shirt was from Shanghai, his jacket from Beijing and his shoes from Guilin! He concluded by playing the guitar accompanied by his wife singing Pokarekare Ana with everyone joining in. He was thanked with a huge round of applause! 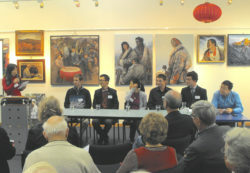 Mike Earle, secretary of Hawke’s Bay branch, thanked Ngahiwi, then Dave Bromwich and Sally Russell welcomed the visitors:- His Excellency the Chinese Ambassador Wang Lutong, Hastings Mayor Lawrence Yule, Mayor of Napier, and Patrick English, ex-NZ consul in China and now Executive Director for the New Zealand China Council. Hastings Mayor Lawrence Yule spoke of first travelling to China 18 years ago, before the introduction of cell phones, when one could get cash straight from a Chinese bank, and he spoke of the the good trade relations then and now with Guilin Hastings’ Sister City. With support from these relationships, they had entry into other parts of China. “China has been bold and brave”, he said, “in its new role, sending people out into the world”. He said that the Chinese return home, having learnt English, but not so the Kiwis or English speakers who don’t bother. He experienced wonderful hospitality whilst in China. He added to great laughter that his trousers were purchased in Shanghai! Dave Adamson (VP South Island) thanked Mr Yule and Dave Bromwich introduced Ambassador, His Excellency Wang Lutong. He was born in 1969, had a career in foreign affairs and was 3rd Secretary in UK for several years. New Zealand is his first posting as ambassador and he has been here for 6 months. Ambassador Wang countered Mr Tomoana’s comments on his sartorial dress by saying he bought his shoes in New Zealand! He also said that he enjoys wine and promised to learn the beautiful dancing and singing of the Maori people whilst he was in NZ. He also mentioned that Hastings was the first city to establish a Sister-City relationship in Guilin, China. He confessed that he was envied when it became known that he was being posted to New Zealand and stated that the NZCFS had made a huge contribution to friendship with his home. Youth exchanges played a large role in this and he noted that students studying here will increase by 6% this year. 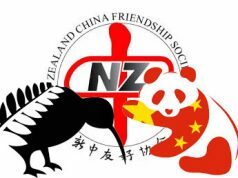 There is a NZ Centre In Beijing and there are three Confucius Institutes in New Zealand. He explained that President Xi Jinping last week said that friendship societies play an important role in implementing communication between countries and the NZCFS is one of its most valued friends. Partnerships are very important and China will need New Zealand’s help in years to come. Ambassador Wang made the announcement that Jayson Zhang, husband of Consul General Tan at the Christchurch consulate, was to donate $5000 to NZCFS from sales of his book “The Beauty of New Zealand”. For Ambassador Wang’s full speech, click HERE. Eric Livingstone, past- president of the Society, then thanked the Ambassador, the 12th to come to New Zealand. He confessed that Kiwis need to work on their Chinese language lessons in schools and he was impressed that the ambassador had got to know us so well since he arrived. “Many branches would like to host you”, Eric stated. Dave Bromwich then spoke, beginning with his confession that his shirt was also from Beijing! He said that Maori people are also ambassadors and cover a wide range of activities. Their role has changed as has China’s, whose changing direction is obvious in many ways. They are emerging as a global power and China has its own interpretation on the world. China’s philosophy is “Harmony with Difference”, meaning that people develop differently but are all basically the same underneath. He then went on to say that, if we are to continue to play a valuable role in the relationship with China, the Society needs to change. We need to regenerate and continue our role in informing and educating. There are many ongoing misconceptions about China and while retaining our impartiality, we can use our influence to inform others of the real China. He then acknowledged the help of Youxie in providing funding (including the RAFE Fund) and opportunities to visit China, and also our sponsor, Mr Simon Deng Li of the Simon Deng Li fund. Dave Bromwich then read a letter from Jayson Zhang praising NZCFS for its work in promoting friendship between the two countries and his pleasure in donating $5000, a substantial proportion of his profits from his book The Beauty of New Zealand, to the Society. He acknowledged a number of people and organisations who supported and sponsored the publication. Dave Bromwich also thanked Jayson not only for the donation, but also for his sincere and warm contribution to NZ and China friendship. The meeting warmly acknowledged Jayson Zhang donation with acclamation. Jayson wrote asking the National Executive to decide how this sum is to be used but asked that some of the money be given to Christchurch branch projects. For Jayson Zhang’s letter, please click HERE. There was a break for morning tea and then it was over to the younger members of the Society to state their intentions for the Society. They impressed the older members very much with their energy and new ideas and click HERE for an in-depth rundown of what they contributed. 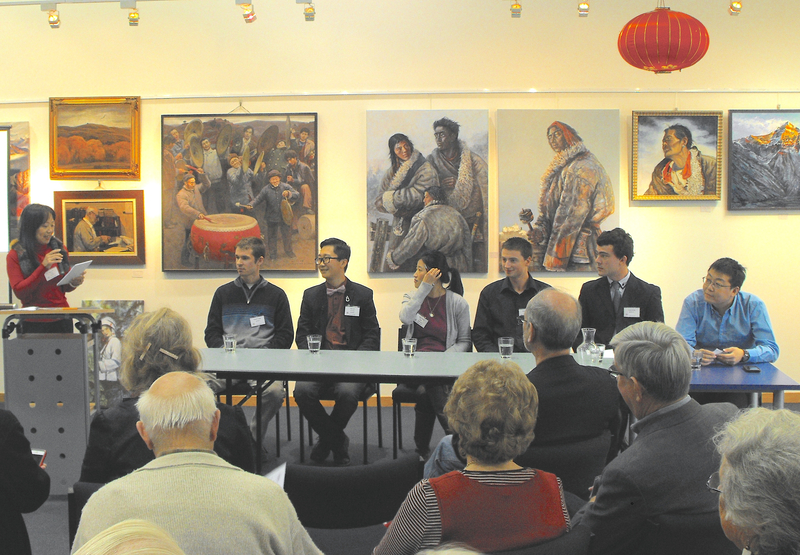 Ken Liu and Hamish Young from Auckland, Jack Irvine, Kirk McDowall and Faye Zhang from Wellington, Tony Tian from Christchurch each gave short talks on the development of the youth part of the Society and their hopes for the future of the Society. Hamish Young (Auckland branch) spent 6 years in China teaching English and now has his own translation business. He feels he wants to do more to help and meet other people, feeling that this will help his company and himself. Ken Liu (Auckland branch) said he bought all his clothes in New Zealand – much laughter again! He joined the society 4 years ago and wanted to thank Chinese-born kiwis and the Society for their help. He said that when he was young in Dalian and spent time on the beach with his parents, he asked what was out there. He loved Japanese sweets and felt he wanted to go out and find them across the water! Extensive communication with the Chinese Government and people in China. Lack of media exposure, not marketing ourselves, don’t have enough people. We need to create more incentives, need a real event which identifies with the Society unlike the Lantern Festival which is for all Chinese. We need to teach people about the great minds of China’s history, to be able to touch souls of Kiwis about Chinese painting. We can create streamlined processes with contacts and take advantage of mainstream media in both NZ and China. Need to be on TV, make people interested in China, give out correct information and correct wrong information. Branches must work together. Suggest one Facebook page for all branches, each branch does it for a month. We don’t get paid but the reward is the work and its success. Need to empower young to do things and encourage them to take up leadership. Can organise a Chinese Corner at schools and universities. 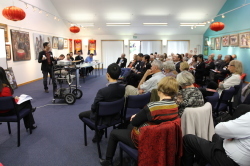 Tony Tian (Christchurch branch) spoke of his 12 years as a Christchurch member and his part on the National Committee. He works for a software company but admitted he prefers paper (much laughter and agreement from the older members to this!). He said he came from China as a student and stayed after graduating. He is happy about Christchurch branch and the way things are run which has plenty of members. But he said there is a need to attract more members and to try and provide regular activities. They have an established news initiative. They have a Youth Initiative fund for their activities and host barbecues at the end of the month. Also they establish links and try to visit other societies to form friendships and promote the Society. Various students are trying to form cultural links and co-operate in projects with others. Wellington’s Faye Zhang rose to say that she came to NZ in 2002 and completed a BA here. 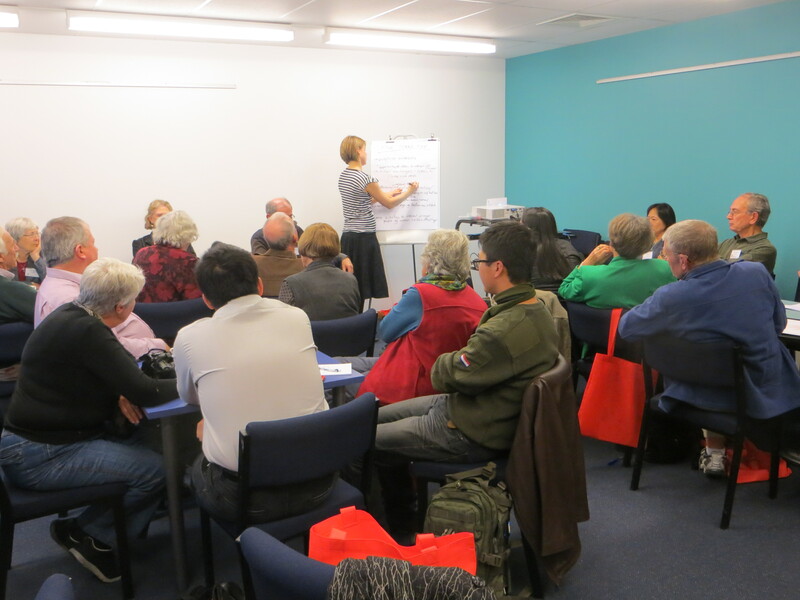 When the Wellington Branch President asked for opinions on youth projects she suggested that social media is often the best method for the young. She has already started a NZCFS Youth website, which she introduced to the meeting, and a Wellington Facebook page, which she began by providing interesting Chinese subjects such as personal stories, the economy, cooking, travel and problems experienced and many other subjects. She posts all these, often translating stories from the Chinese. She says they can write New Zealand stories to pass on to the Chinese and vice versa as a way of communicating on a personal level. Wellington also has a quiz night on the website and articles such as “The Myth of Acupuncture”, and tourism in Guangzhou as well as news. Kirk McDowall from Wellington then said he had visited Guangzhou and Shanghai for six months and didn’t speak Chinese then, but has since wanted to learn Mandarin and so joined NZCFS. He said that Wellington had dinners but more interaction would be good and he likes to be involved. He also has helped with the Facebook project. He also thinks that we can contribute to increasing awareness of environmentalism in China and feels that young people should perhaps be assisted to travel to China to help in this valuable work. Jack Irvine from Wellington explained that he went to China at 18 and taught English in Chengdu. He thirsted for outside knowledge of the world and this drove him to begin learning Chinese. He completed a Masters Degree in Teaching Chinese as a Second Language. When he returned to NZ, he confessed it was a bit of a culture shock but thanks to Dave Bromwich, found much to do. He feels we can increase the culture between our two countries on a social level and is glad to find that the Society does just that. He feels we should increase media image and Facebook to further our friendships. The youth forum then opened to discussion. Jan McLeod of Wanganui branch spoke on promoting Kiwi ways and that we needed to send information on environmental awareness as much as we can. We also need to teach primary school children about this too. Branches are donating books for this cause. Miao Fan of Hamilton thanked the Youth Group for their contribution, hard work and passion, and closed the discussion. Michael Powles, President of Wellington branch, in thanking the panellists. spoke of the differing needs of each branch, but that the youth must be allowed to speak for themselves. He felt that the Society had taken an enormous step forward and had now taken on board the importance of youth in the Society. In the afternoon, Geraldine Travers, principal of Hastings Girls’ High School (among whose students were the welcoming kapa haka girls) was invited to speak. She stated that the school was well known for its international activities. She said that China had become a big part of her life and she had been thrilled when she was invited some years ago to go on the Prominent Persons Tour [Editor’s note: Now known as the Prominent Persons and Leaders Delegation]. She then felt she had to reciprocate. 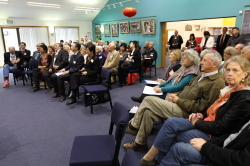 Strong links have been forged with Guilin as Hawkes Bay’s Sister City [the first Sister City relationship with a China city in New Zealand – 33 years ago] and two girls from China spent 6 months learning English in Hawkes Bay. One girl stayed on after her six months and continued her education here, becoming Dux of the school. Xin Yang, the student in question, said that as her fellow Chinese always did science subjects or English, she decided to do Psychology. The reason she gave was that there is a growing middle class in China and eventually they will need to go to psychologists to reduce their stress levels! Geraldine said the school executives racked their brains on how to further this communication/relationship/initiative and they really wanted to concentrate on helping less fortunate children. This prompted another initiative when two Chinese students lived in a home-stay environment with an extended Maori family who owned a dairy farm. Then they returned and two Kiwis flew out to Guilin. The school is very much hoping that this interchange will continue. One girl, Hannah, who flew to Guilin for six weeks sent a letter back, which eventuated in a teacher being paid for a side trip to Guilin before she went on to Europe. The Kiwi-raised Chinese boy, who travelled to Guilin, was worried that he couldn’t speak Chinese but his teacher helped him out in many ways. ‘Education Link in China‘ sends teachers for two-year experience and Hastings teachers do a similar thing. Pat English, former Consul General in Guangzhou and currently Executive Director of NZ China Council, introduced Raymond Huo, Labour list MP. Raymond was born in China and is a trustee of the Asia NZ Foundation, and is also a member of Auckland Branch. Raymond has published several books including a Chinese dictionary. He paid tribute to Rewi Alley who always inspired him and was the reason he came to New Zealand. He said we need to familiarise ourselves with Chinese culture and have meaningful relationships with that country. NZ was the first country to initiate a trade agreement with China and trade has tripled since then and is only one of six countries to have trade agreements with China. He explained that Mandarin is being spoken in many large cities now and went on to say that there are hundreds of dialects but only one written language which everyone understands. There are 171,000 Chinese in NZ now which has a multi-cultural atmosphere where people are encouraged to be themselves but also to be a kiwi too. “We need a positive and quality media connection and need to move into mainstream media to report Chinese issues”, he said. Chinese people who live in NZ tend not to get involved with Parliament – only 2 or 3 submissions have been made in the last 20 years. We must encourage Chinese Kiwis to take part more in social issues so that they are not marginalised. 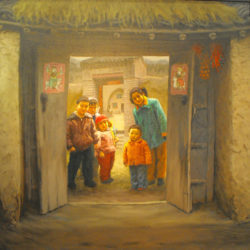 A Chinese Language Week could help them to participate more in the running of the country. 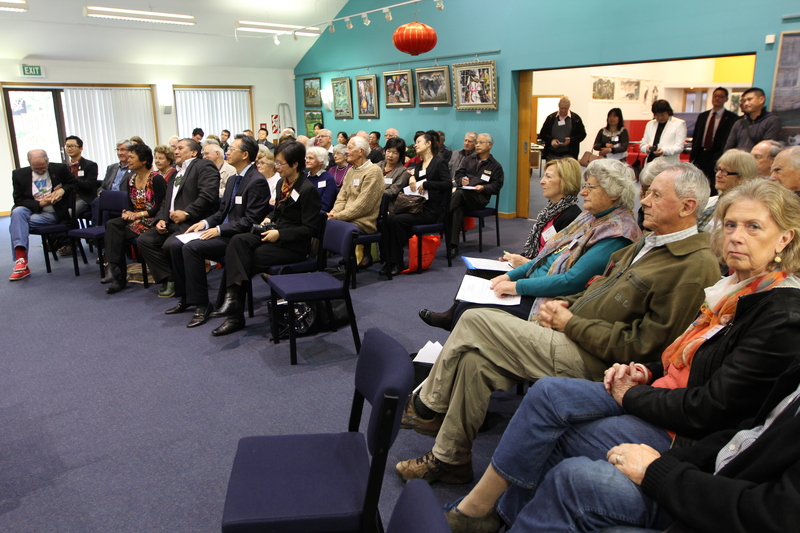 Chinese Language Week is a new initiative and NZCFS Conference was chosen as the venue to publicly announce the formation of the CLW Trust. It was inaugurated by the signing of the trust document by Raymond Huo, Ambassador Wang, Pat English and Dave Bromwich. 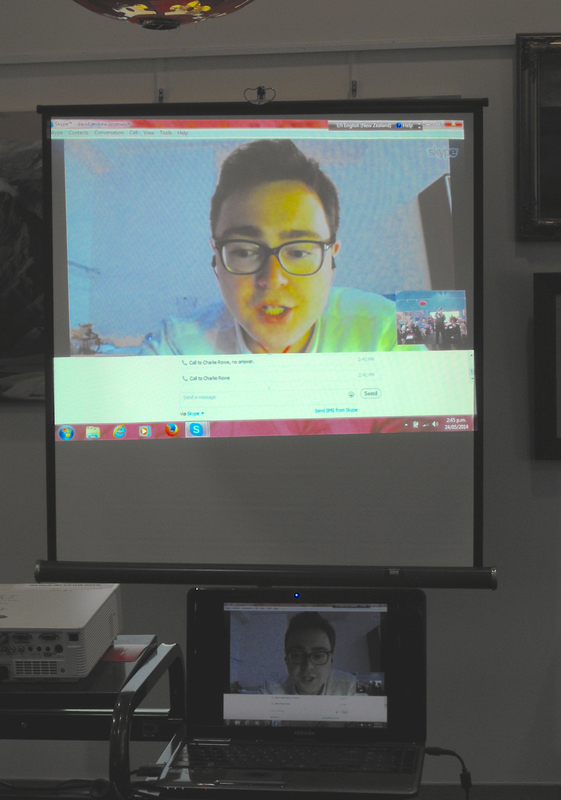 Skype with Charles Rowe, our first Youth Intern in China. The audience were treated to a short skype connection with Charles Rowe in Beijing. The quality of the call was good and Charles thanked the Society for the opportunity to take up an internship in 2013. He hoped the conference was going well and said he was very pleased with his progress in joining up the many New Zealanders who were living in Beijing and providing a network among themselves and the Chinese. He felt government organisations didn’t have the same network ability but he was trying to improve on this as a representative of NZCFS. He also spoke of the success of the 60th Anniversary celebrations of Youxie where he and Jessica Rowe were the youthful representatives on the Society. President Xi Jinping also attended the celebrations, which was an amazing opportunity for him and Jessica. He said that others were surprised at their youth but considered it a very good thing that the Society were willing to hand over responsibility to younger people and he highlighted the importance of young people having a physical presence there in Beijing. In the afternoon, the members were treated to a concert by the Hawke’s Bay Youth Orchestra with Chen Xi Yao, one of Hamilton’s members, who is an expert on the gu-zheng. Chen composed a piece called “The River” for the gu-zheng in honour of the Society’s sponsor, Mr Simon Deng Li and the youth orchestra accompanied him as well as playing some pieces of their own. In the evening, there was a banquet and people generally mingled with each other getting to know the other branches’ members. The Annual General Meeting was held in the morning with reports from various branches and specialty groups. Life members Eric Livingstone, Margaret Cooper, Bill Willmott and Cecil Fowler were honoured. The Roll of Honour was read out which included Stan Boyle (Hamilton), Jim Hunter (Timaru), James [Jim] Roxburgh (Nelson), Jack McCreanor (Wellington), Nanette Kwok (Wellington), Frank Kwok (Wellington), Keith Sellar (Hawke’s Bay), Lewis Stewart (Hawke’s Bay), Peter Bloomer (Hawke’s Bay), Malcolm Moses (Auckland), Rob Cooper (Dunedin), Kwok Wing [Mick] Joe (Hamilton). Apologies, greetings and messages followed. Delegates were asked to choose five candidates for the National Executive. Those chosen were Deborah Rhode, Kenneth Liu, Tony Tian, Miao Fan and Ann White. Dave Bromwich discussed the Society’s tours and said each tour raised on average $12,000, with a total of about $40,000 for three tours per year. He said it was important that we encourage people to go on tours and need to make people from outside more aware of them. The tours are also more viable the larger the group. Secretary Heiko Lade spoke about the urgency of a full mailing list being achieved. Some branches are unaware of how many members they have and this results in many people not being aware of the activities of the Society. He urged all branches to supply a full list of members to him. This should be done to tie in with capitation fees at the end of the calendar year. There was further discussion on whether people’s email addresses should be given out as a matter of course to keep them informed of the Society’s activities and that people be given an opportunity to agree to be on a mailing list. If, however, they didn’t respond within a given time, they would be presumed to have accepted that they would be notified of Society news. The Branches were then given 5 minutes each to comment on their activities throughout the year. The AGM finished with Dave Bromwich thanking the delegates for attending and also Hawke’s Bay for hosting the event. For the detailed minutes of the AGM, please refer to them in the Members’ Area of the website. In the afternoon, the new National Executive had their first meeting from 1pm to 2pm. See Sally Russell’s ‘news release’ article on this website for an excellent summary of Conference events and more photos.